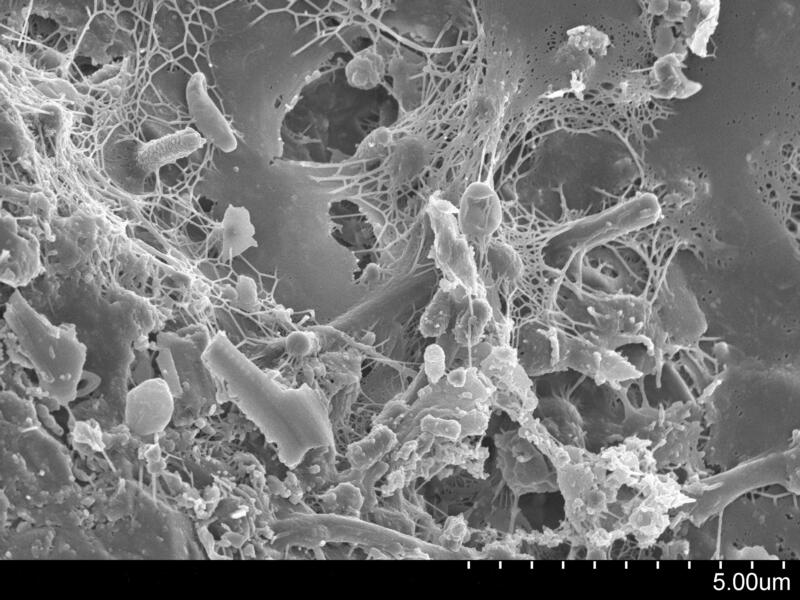 Do biofilms on dry hospital surfaces change how we think about hospital disinfection? An important paper published in the Journal of Hospital Infection has identified biofilms on dry hospital surfaces. 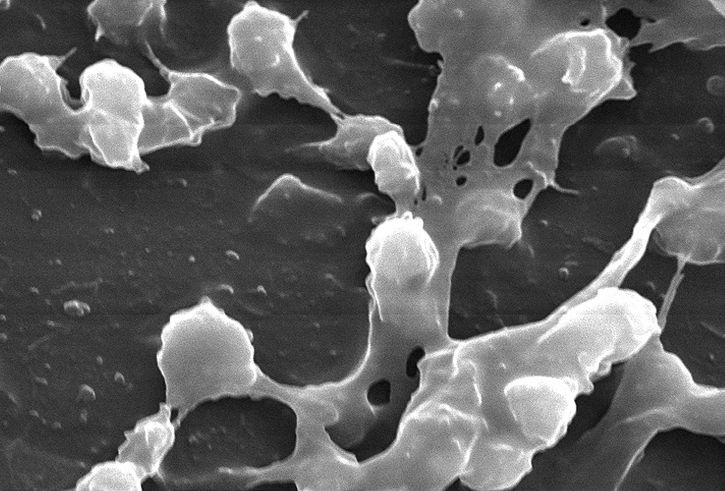 Biofilms are known to be important in several areas of medicine including indwelling medical devices and endoscope tubing, usually associated with surface-water interfaces. However, it was unclear whether biofilms formed on dry hospital surfaces. The study by Vickery et al. ‘destructively sampled’ several hospital surfaces after cleaning and disinfection using bleach (i.e. cut the materials out of the hospital environment and took them to the lab for analysis). 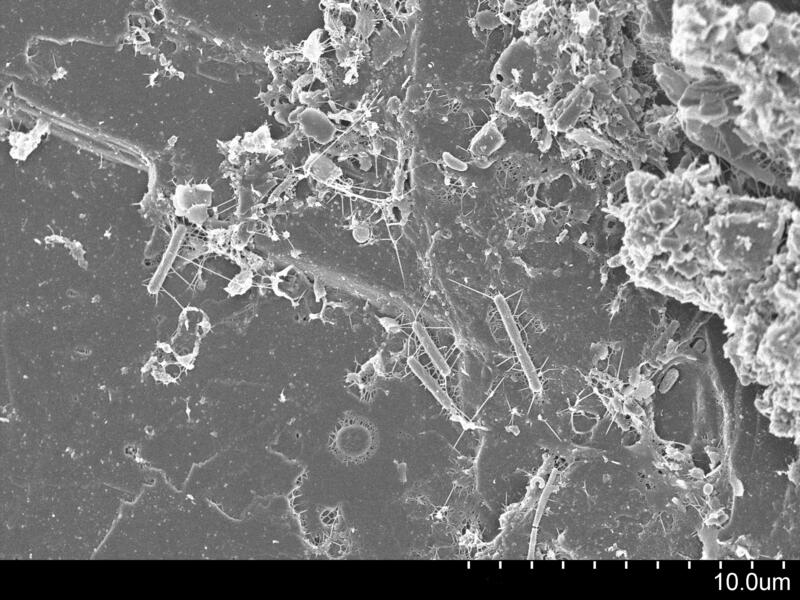 Scanning electron microscopy was used to examine the surfaces for biofilms, which were identified on 5/6 surfaces: a curtain, a blind cord, a plastic door, a wash basin and a reagent bucket. Furthermore, MRSA was identified in the biofilm on three of the surfaces. Could it be that we have missed or underestimated the importance of biofilms on dry hospital surfaces? Biofilms could explain why vegetative bacteria can survive on dry hospital surfaces for so long, be part of the reason why they are so difficult to remove or inactivate using disinfectants (bacteria in biofilms can be 1000x more difficult to kill than corresponding planktonic bacteria) and explain to some degree the difficulty in recovering environmental pathogens by surface sampling. Biofilms are clearly not the only reason for failures in hospital disinfection given the difficulty in achieving adequate distribution and contact time using manual methods, but these findings may have implications for infection control practices within hospitals and on the choice of the appropriate disinfectants used to decontaminate surfaces. Article citation: Vickery K, Deva A, Jacombs A, Allan J, Valente P, Gosbell IB. Presence of biofilm containing viable multiresistant organisms despite terminal cleaning on clinical surfaces in an intensive care unit. J Hosp Infect 2012; 80: 52-55.